【出土品】奈良県橿原市 新堂遺跡／archaeological site of Shindo in Kashihara city, Nara prefecture. 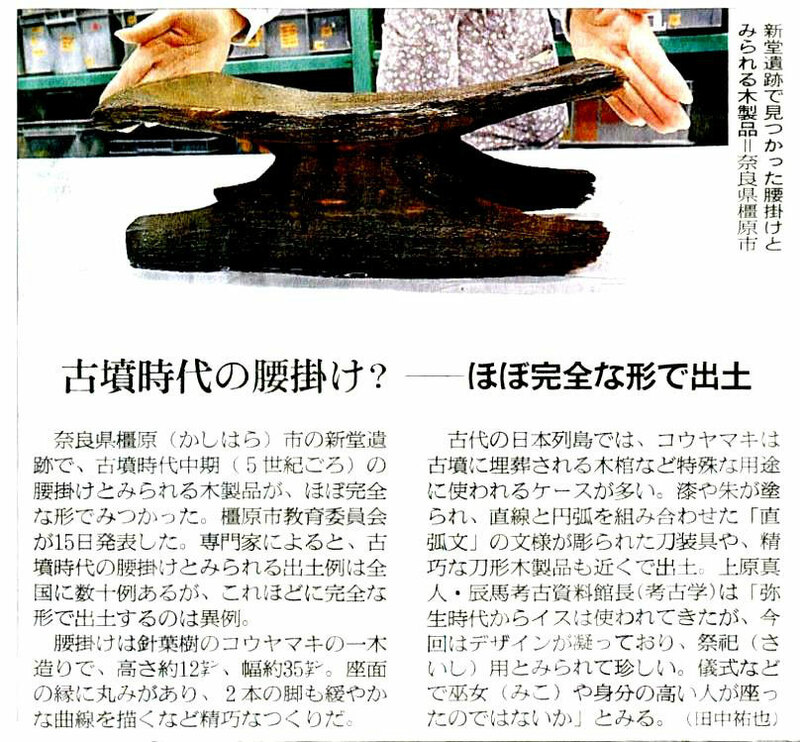 In complete style ancient wood products have been unearthed in archaeological site of Shindo in Kashihara city, Nara prefecture. This artifact like seat is thought to have been made in middle Kofun period; circa 5 century, which is confirmed by theory of Ms. Kazuko Koizumi chairperson of The Japan Society for the History of Interiors, Furniture and Tools. And this is quite similar to seat part of clay image unearthed in Akabori -Chausuyama tomb in Gunma prefecture, arch shape suited to human body shows human efforts and technical development. Of course, clay image abbreviates the details of the origin, but this unearthing fills in the missing piece of history of furniture and wood working. Moreover from this work we could know woodworking technique developed from curving. 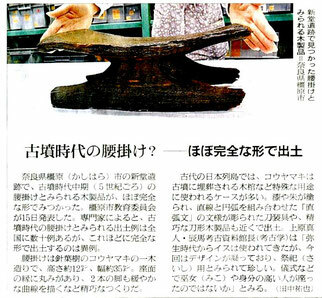 The material of it is Sciadopitys verticillata, koyamaki, or Japanese umbrella-pine, which is known for its water resistance, so story of Susanoo-no-Mikoto, Shinto god of the sea and storms in “Nihon-shoki”, the oldest chronicles of Japan, says this wood is peculiar in Japan valued as material for coffin in ancient times. Japanese umbrella-pine is also famous as the material of coffin of Muryeong of Baekje,the 25th king of Baekje, one of the Three Kingdoms of Korea.